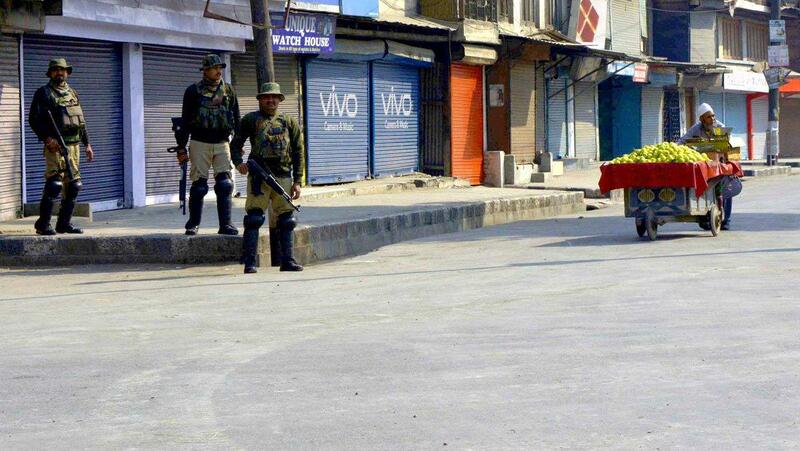 JAMMU: Curfew-bound Kishtwar district limped back to normalcy, as authorities gave relaxation in restriction for four-and-a-half hour on Monday, even as Army columns deployed across the district were also withdrawn. The improvement in the overall law and order situation, also allowed the authorities to restore mobile internet services after remaining suspended for the past six days after the Law and Order situation erupted following the killing of senior RSS leader Chanderkant Sharma and his security guard by militants inside district hospital. The communally-sensitive district will face the real normalcy test on Tuesday when there would be straight 14 hours of relaxation from 6 in the morning till 8 in evening. Based on the situation, the district authorities are likely to lift the curfew on Wednesday, a day before the elections to Lok Sabha are scheduled to take place there. The curfew, which was promulgated in the town and adjoining areas Tuesday last week following the killings was relaxed for 4 hours and 30 minutes in two phases on Monday, during which no untoward incident was reported from across the district. "The situation is fast limping back to normalcy...the mobile internet services were restored, while the curfew was relaxed from 12.00 pm to 3 pm for the first time in the entire town," district development commissioner, Kishtwar, A S Rana informed The News Now. “We had plans to extend the relaxation for another three hours, but keeping in view the presence of Congress leader Ghulam Nabi Azad in the town, we had to re-impose the curfew from 3 to 5 pm,” he said. Azad was in the town to attend the last rites of a local Congress leader. “From 5 pm till 6:30 pm, the curfew was relaxed again. Heavy rush of shoppers was witnessed in the main markets. The relaxation period passed off peacefully,” Rana said. Asserting that the situation is well under control, Rana said that the curfew will be relaxed from 6 am till 8 pm on Tuesday. “We will be monitoring the situation and any further decision on curfew will be an outcome of how the things pan out tomorrow,” Rana said. He also added that army columns deployed in the town have been withdrawn. The RSS leader's killing had triggered violent protests with angry mourners ransacking the office of the senior superintendent of police, prompting authorities to impose strict curfew in the communally-sensitive town and adjoining areas.